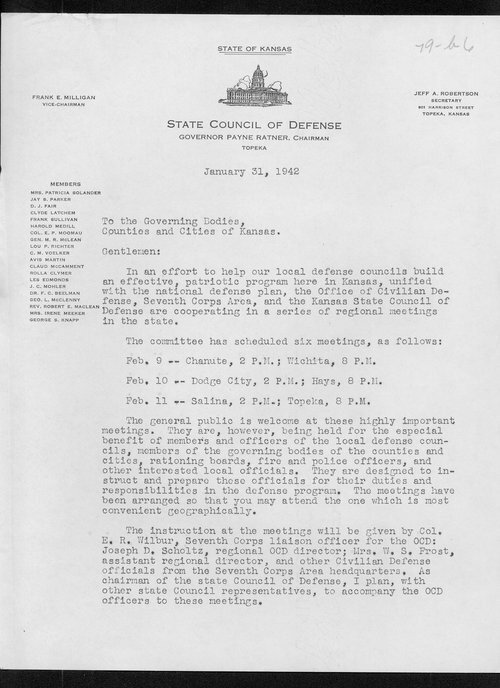 In this letter to the Governing Boides of the Counties and Cities of Kansas, Governor Payne Ratner explains that a number of reional meetings of the Kansas State Council of Defense will be held throughout the state in order to "instruct and perpare" officers and members of the local defense councils "for their duties and repsonsibilities in the defense programs." As with other states during World War II, the Civilian Defense councils in Kansas were designed to ready civilians and civilian agencies for the threat of attack on the U.S. This item can be used in conjunction with other material on the home front during World War II to provide students with insight into the activities of those left behind as U.S. soldiers headed off to war.